Apparent Etch has moved to Rackspace for hosting needs. 5 years ago, I was content with Hostmonster’s affordable (not so much in retrospect) shared hosting. I started a website to post pictures on and play with my fledgling HTML skills. Over time, I started this blog and have gotten a steady daily stream of readers. 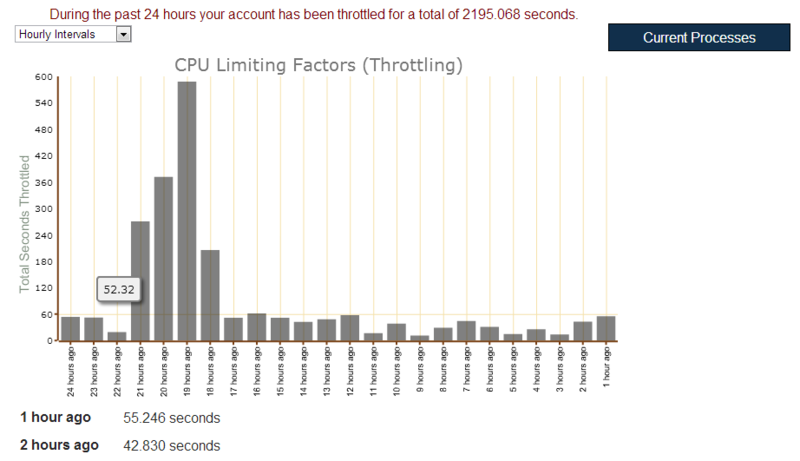 I rarely experience CPU Throttling a few years back. But the past year, it seemed as if my account was being throttled for the slightest amount of action. – Dedicated IP is ~$18/yr. – The Comodo SSL certificate requires the dedicated IP plan. – Server wise, the Hostmonster server has an 8 core Intel Xeon CPU and 24-32GB of memory that is shared among thousands of sites. Server details gotten from SSH access. – Cloud Server 1 CPU, 512MB, 20GB disk space, and a capped network bandwidth of 20Mbps for ~$16/mo. which is $192/yr. The server also includes one IPv4 and one IPv6 address. – RapidSSL certificate for 4 years at ~$8 a year. Amounts have been rounded for ease of calculations. Is the extra $62/yr worth it? Instead of “unlimited” yet shared resources which are 8x of what Rackspace’s lowest Cloud Server offers, I get a set amount of resources which are guaranteed for that one Cloud Server. Consider how Hostmonster has been throttling performance and how its network speed slows to a crawl at times, the difference in price is worth it. So, goodbye Hostmonster hosting, it has been a good and bad five years with you. I am still working on the migration and some things on this site will be inconsistent (theme, etc) through this week 4/8-4/14. Maybe I’ll change the blog’s theme since The Theme Foundry is no longer supporting the Titan theme. We will continue to make sure it is compatible with the most recent version of WordPress but will not be making any other upgrades or improvements to the theme. The website’s current configuration is Nginx with a Unix socket to PHP5-FPM, MySQL, and WordPress running on top. – Try changing the php-fpm process manager to ondemand. The ondemand option decreased my memory usage from ~500MB to ~100MB. – Reduce clutter and disk space of log files.